This delicious marriage of surf and turf flavours features hand-cut fries, rosemary-coated PEI rib-eye steak and sautéed mixed wild mushrooms served with leek and bacon oysters Rockefeller. 1. 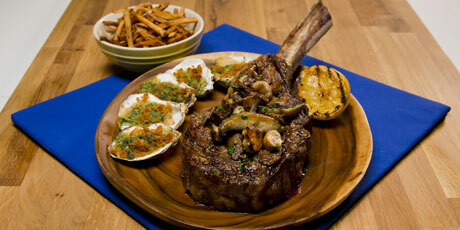 Coat rib-eye in all of the ingredients above and marinate at room temperature for 45 minutes. 2. Preheat a grill to medium high heat. Place steak on grill and allow steak to char on both sides, approximately 8 minutes per side. 3. Remove steak from the grill and rest until the internal temperature is 125-131ºF (52-55ºC). This will be served at a medium rare temperature. 1. Heat oil to 250ºF (121ºC). 2. Blanch frites for 5 minutes, remove and set aside. 3. Just before you’re ready to eat, turn the temperate of the oil to 350ºF (177ºC) and re-fry the frites until crispy and golden, about 3-5 minutes. 4. Remove fries from oil, place in a bowl and season with salt. 1. On medium-high, heat a frying pan. Add grapeseed oil, when the oil is lightly smoking, add the mushrooms. 2. Sauté until golden brown, about 12-15 minutes. 3. Add the butter and garlic. Continue cooking until garlic is cooked, about 2 minutes. 5. Finish mushrooms with chopped parsley and lemon juice. 1. In a cast iron pan on medium heat, render bacon half cooked, about 3-5 minutes. 2. Add onion and wild leeks. Season lightly with salt and pepper. 3. Add spinach and cream. Continue cooking until mixture has thickened. 4. Bring mixture to a food processor and pulse until finely chopped. 5. Spoon a small amount of the mixture on top of the oysters. 6. Top with breadcrumbs lemon zest. Bake at 450ºF (230ºC) for 5 minutes, or until oysters are bubbly and golden brown.